The Indian constitution has many distinctive features of its own. Constitution is a living document. 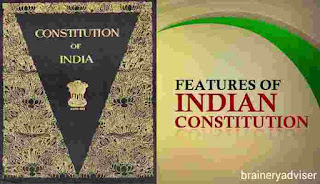 There are certain Main Features of the Indian Constitution which are very crucial to know up, being a citizen of India. 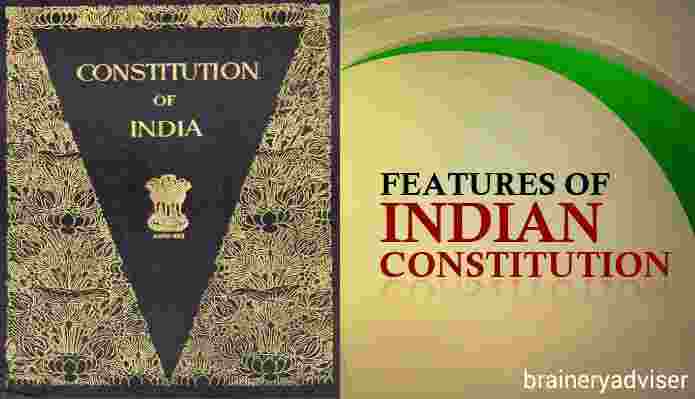 The Features of the Indian Constitution are discussed below. In short constitution is the collection of principles or body of fundamental rules which usualy provide for the establishment. Another Features of the Indian Constitution is that, it is the most detailed of all the written constitution of the world. The Indian constitution originally consisted of 499 Articles divided into 25 parts and 12 sechdule. The Features of the indian constitution which we are going to discussed today. The essence of the Parliamentary Government is its responsibilty to the legislature. The President is the Constitutional head of the State but the real Executive Powers is vested in the Council ministers whose head is the Prime minister. The Constitution of India established a parliamentary from of government both at centre and the state. In this respect the makers of constituion have followed the British model. However , the succes of parliamentary from of Government in India has been marred by multiplicity of political party . Another features of the indian constitution is the lengthiest Constitution in the world. Indian Constitution Originally consists of 449 Articles divided into 25 parts and 12 schedule. Indian constitution is the lengthiest and most detailed of all the written constitution of the world. (i)The Constitution contains a Fundamental rights and numbers of Directive principles. (ii) It lays down the structure not only of the Central government but also the state. (iii)The makers of Indian constitution have gained experience from the working of all the known constitution of the world . Part III of the Indian constitution dealing with the Fundamental rights of people provides one of the most important features of the indian constitution.The State government cannot make any law which take away any of the rights which included in part III of the constitution. These Rights are prohibitions against the state.It must however be clearly understood that Fundamental Rights are not absolute. They are subject to certain restrictions. Another features of the Indian constitution is Directive Principles of State Policy. Part IV of the Indian Constitution dealing with the directive principles of State Policy , provides one of the most striking features of the Indian Constitution. Part IV of the constitution set out the aims and objectives to be taken up by the state in the governance of the country.The Directive Principles are the instructions to the State for securing socio -economic developmental objectives through its policies. Unlike the fundamental rights , the rights are not justiciable. A rigid Constitution is one which requires a special method of amendment of any of its provisions while in flexible constitution any of its provisions can be amended by ordinary legislative process. The Indian constitution is neither rigid nor flexibility it is mixture of both. Some of its provisions can be amended in a difficult way while others can amended very easily.A written constitution is generally said to be rigid. In some case the unino parliament can amend some parts of the constitution by passing a simple law. Another main features of the Indian constitution is Adult Suffrage now the uniform adult suffrage system has been adopted and thr old system of communal electorates has been abolished. In Indian all men and women enjoy equal right to vote. Under the indian constitution every man and women above 18 years of age has right to elect representation for the legislature.This suffrage is wider than all the democratic countries which have given right to vote to their people. During the proclamation of emergency all powers are centralised in the union government and constitution acquires a unitery character. This Combination of fedral and unitary system is unique feature of the Indian Constitution. During Emergency the normal distribution of powers between centre and state undergoes a vital change.The union parliament is empowered to legislate on any subject mentioned in the state list .The Central Government is empowered to give directions to states as to the manner in which it should exercise its executive powers. One of the Main features of the Indian Constitution is An Independent Judiciary. In a federal Constitution it plays a another significant role of determining the limits of power of the centre and states.The Constitution of India provides an Independent Judiciary which ensures that the Government is carried on in accordance with the provisions of the constitution. It acts as the guardain of liberties and fundamental Rights of the Citizens . For this purpose an Independent and impartial judiciary with a power of Judicial review has been established under the Constitution of India. Another features of Indian Constitution is A Secular State. The constitution of India established a secular from of state .In a Secular state , the state only regulates the relationship between man and man. It is not concerned with the relationship of man and god. A secular state has no religion of its own as recongnised religion of state . It treats all religion equally. Indian constitution provide an equal treatment for all religion. There is no such thing as a state religion. The constitution provides the right to religious freedom to all the citizens. The Constitution of india provide a single Citizenship system .There is only one citizenship in India , There is no state Citizenship. The preamble declares that resolve of the people of India to secure to all is citizens "liberty of......belief , faith and worship". Every Indian is the citizen of India and enjoys the same rights no matter in what state he resides. Fundamental Duties is the Main features of the Indian Constitution, the Constitution also contain a list of 11 fundamental duties of citizens. While 10 of this duties were added to constitution by 42 th amendment in 1976. The eleventh duty was added by the 86 th amendment act 2002. It requires the Citizens to observe certain basic norms of Democratic conduct and democratic behaviour. India is the largest Democratic country in the world, the Constitution of India provides for a democratic system. In Democracy the supreme power is vested in the people and exercised by them directly or indirectly through election. India is known to have a successful democratic system, Democracy is said to be the best form of government. The citizens in a democratic nation enjoy the right to vote and elect their government. So, these were the Main features of the Indian constitution, that are essential to know and look upon. Without these features the constitution of India couldn't have been formed. There are many more, but these features are worthy to know and understand. The Features of Indian constitution are based for the proper working and development of the country. Without these features our country would be chaotic to live upon. Moreover, there wouldn't be a peaceful environment. These features are not only essential for the country but also for our own self.